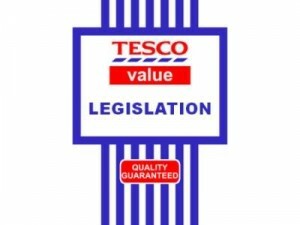 John Flood's Random Academic Thoughts (RATs): Tesco (Ireland) Law? 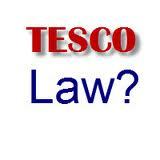 Ireland is about to head towards Tesco Law. Turns out that Tesco is in Ireland also, so that helps. Last Friday (25 November) I spoke at a conference at University College Dublin on Regulating the Legal Profession. The Competition Authority has concluded that the legal profession is in need of substantial reform. The profession is permeated with unnecessary and disproportionate restrictions on competition which should be removed so that consumers can benefit from greater competition in legal services. - the legal profession, establishing an independent regulator for the profession and implementing the recommendations of the Legal Costs Working Group and outstanding Competition Authority recommendations to reduce legal costs. One journalist at the conference joked that "You should never waste a good crisis if you want to get something changed." The Irish government was given slightly less than a year to introduce these changes. The Irish legal profession had been successful before at fighting off change until now. The conference, organized by Colin Scott, Dean of UCD Law School, attempted to bridge the divide between regulators and practitioners and academics so that a useful conversation might flow. Something flowed at least. For Julian Webb (who spoke on the Legal Education and Training Review) and myself it was like looking back through a time tunnel to five years ago in the UK when the legal profession was so defensive about the changes being introduced by the Legal Services Act 2007. The Irish bill essentially proposes the same things that the British have done--separate and external regulator, separating representative and regulatory elements of professional legal bodies, reformed legal training, more open and unrestricted access to lawyers' services either through firms or ABS, and external complaints procedures. The practitioner speakers at the conference saw these proposals as threats to the integrity and independence of the legal profession. They desire to kill the bill. That isn't going to happen. If they want to pick a fight that they have some chance of coming out of alive then it will be in the negotiations over the details of regulation after the legislation is passed. They know this but still feel as if they must go through the motions. It's a waste of political capital. I feel we've started a dialogue of sorts. This was helped by trying to put the Irish experience in a less parochial context. Lynn Mather of Buffalo gave a keynote speech on lawyers, the market and the state which theorized some the issues that legal professions face. I placed the regulatory push into its global context. And Colin Scott distinguished meta-regulation from mega-regulation which you can get an idea of from his inaugural lecture, Regulating Everything. From both economics and sociological perspectives there is no doubt that these changes will occur. More conferences and workshops will be needed to develop the conversations. I also attended the Conference on the Regulation of the Legal Profession in Ireland last Friday. It was apparent that the Irish legal professions are highly resistant to change, with many contributors seemingly very angry about the forthcoming reforms contained in the Legal Services Regulation Bill 2011. It was argued that the implimentation of the Bill would lead to widespread unemployment amongst legal professionals. However any such trend is due more to the wider economic problems which Ireland is experiencing than to the possible enactment of the Bill. The growth of the Irish property bubble was aided and abetted by the combined activities of an unholy Trinity, consisting of bankers, property developers and lawyers, none of whom take any responsiblility for the results of their combined activities. The Irish legal profession would do well to acknowledge that it played a part in creating the current economic difficulties, by failing to properly regulate its own activities, including the issuance of undertakings (RIP self-regulation). The sooner the legal profession recognises it was part of the Irish problem, the sooner it might become part of a solution. Ireland needs a legal profession which is affordable and trustworthy, and the enactment of the Legal Services Regulation Bill will take us one important step futher towards it. Thank you for your thoughtful comment, Maeve. I agree with your sentiments. Lawyers have so far remained unaccountable for the role in the crisis. We need to examine this carefully. I don't think the changes will necessarily lead to unemployment among lawyers. We've seen the profession do that to itself over the last few years. However, the changes should free up the market so that new forms of practice and organization can be formed without the current restrictions. What Should We Be Teaching in Law School?